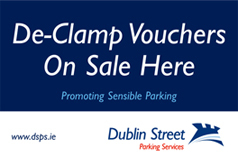 Dublin Street Parking Services operates a Tow-Away and Clamping Service as a traffic management measure to deter illegal parking. Vehicles causing a hazard or obstruction may be relocated & clamped. To make an online representation regarding the clamping or towing of your vehicle click on the appeal form below. If the appeal is unsuccessful and you are dissatisfied with the outcome you can make a further appeal to the National Transport Authority (NTA). The appeal must be made within 30 days of receipt of notification of the decision of Dublin Street Parking Services. Further details are available at National Transport Authority – Appeals and Complaints. Please enclose any documentation which you feel may substantiate your case. We aim to reach a decision within 21 days. All of the parking regulations are designed to make life in Dublin City more pleasant, more orderly and more convenient for everyone. increase the availability of on-street parking to more people. Remember, it is the motorists’ responsibility to ensure that they are complying with the regulations when they park their vehicles on the street. A vehicle must be removed when the maximum time allowed for parking (usually 3 hours) expires and it cannot be parked again on the same street within an hour of its removal.